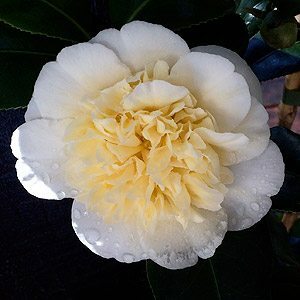 With near white petals and creamy yellow petaliods, Camellia Brushfield’s Yellow was bred in Australia in the late 1960s. Anemone type flowers are very attractive from mid winter to early spring. A good upright growth habit makes this a plant well suited to hedging or an informal screen. Very attractive flowers that are long lasting in a shaded sheltered position. Once established ‘Brushfield’s Yellow’ is a remarkably easy plant, very undemanding and easy to prune. Position – Part shade to afternoon shade. Easy care in the right position, Camellia ‘Brushfield’s Yellow’ is a japonica type and will have better flowers in part shade with protection from winds. Apply a specialist camellia and azalea fertilizer in spring after flowering.